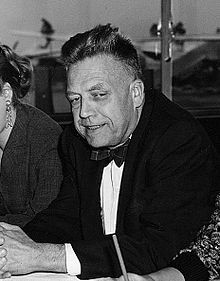 Alfred Charles Kinsey (June 23, 1894 – August 25, 1956) was an American biologist. He was born in Hoboken, New Jersey. In the first part of his career he was an entomologist specializing in gall wasps of the family Cynipidae. Later, he became famous for the research he did on human sexuality. His research had a great influence on social and cultural values in many parts of the world. It also had an influence on the sexual revolution of the 1960s and 70s. Kinsey and his co-workers wrote two books which became known as the Kinsey Reports. They were based on thousands of interviews with men (first report), and then women. The aim was to find out how widespread or differentiated human sexual practices were. He developed the Kinsey Scale to measure sexual orientation. On one end of the scale, at the value 0, the individual is entirely heterosexual. On the other end, at value 6, he or she has a purely homosexual orientation. Kinsey was bisexual. Kinsey died of heart disease and pneumonia in Bloomington, Indiana. A biopic of him, Kinsey, was released in 2004. ↑ Kinsey, Alfred et al 1948. Sexual behavior in the human male. Saunders. ↑ Kinsey, Alfred et al 1953. Sexual behavior in the human female. Saunders.